Posted: November 15, 2018, 10:51 a.m.
At 3:20 p.m. on Friday, Nov. 9, a Clackamas County Sheriff's Office Patrol deputy was flagged down by a man in the 29000 block of S. Dryland Road, south of Heintz Road in Canby. The man was yelling that there was "a crash at the pond." The deputy drove another 50 yards north -- and saw a black car against a tree in the middle of a duck pond. There was debris everywhere, and the water was still rippling from the impact. The deputy had missed the crash by seconds. Skid marks (93 feet of them, by later measurements) were visible on the roadway, from the top of the hill on the north side of the road leading across the road and off the roadway. 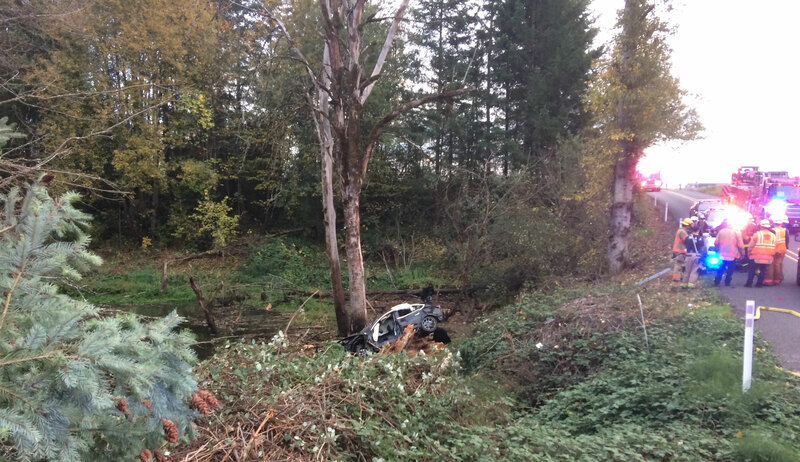 A trail of broken trees led to the partially submerged vehicle. 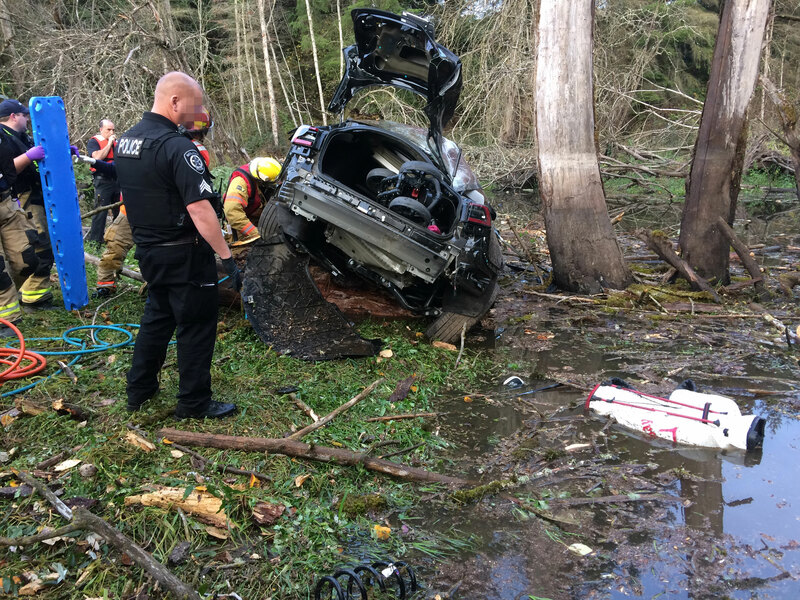 Authorities would later determine that the car had entered a slide, traveled into the oncoming lane and left the road, knocking over trees and going airborne for approximately 20 feet before coming to a stop in the pond. The deputy made his way down an embankment to the vehicle. A debris field of car parts and golf clubs ranged 20 yards back to the roadway. 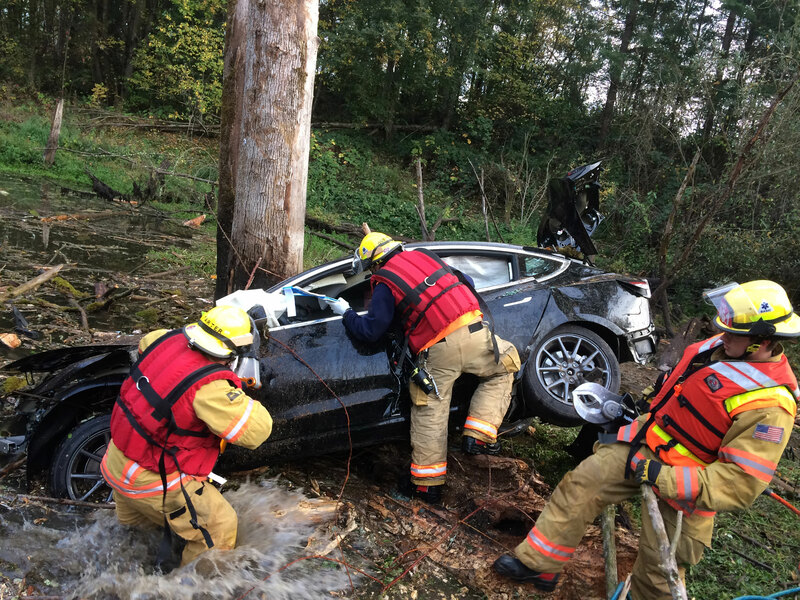 The wrecked car -- a 2018 Tesla -- was resting on a dead tree trunk. The Tesla's front end was partially submerged in approximately 4 feet of water. An ejected golf bag floated nearby. The deputy cut away an airbag to assess the driver and vehicle interior. The injured driver was slumped to the side, but breathing. The passenger side floorboard was filling with water. The driver regained consciousness and was able to identify himself to the deputy. Fire and medical arrived. Canby Fire personnel cut away the driver's-side door to extract the driver. (A photo is linked above.) Life Flight then airlifted the driver to an area hospital for treatment of significant injuries, including multiple fractures. Speed and alcohol are considered factors in the crash. The driver's blood alcohol content (BAC) was reportedly later measured at .174%; motorists will fail a DUII field test if their BAC reading is 0.08% or higher. The case will be referred to the Clackamas County DA's Office for consideration of criminal charges. The driver is identified as Eric John Loechle, 44. He was driving alone, and no other property was damaged in the crash.